Individuals who are be suffering from uncontrollable seizures are given phenytoin for its management. This medication is safe and beneficial for the patient long as it is taken in accordance with the physician’s order. Increased levels of phenytoin in the body can produce toxicity symptoms [1, 2]. The medication phenytoin is classified as an anticonvulsant and acts primarily on the motor cortex of the brain. It is thought to inhibit seizure activity by increasing the efflux of sodium from the neurons. This will stabilize the threshold of these neurons against the hyperexcitability caused by environmental changes or excessive stimulation . This medication has been indicated for most types of seizure disorders including status epilepticus but it is not used for the management of absence seizures . Known side effects of taking phenytoin may include constipation, confusion, irritability, vertigo, drowsiness, fatigue, and mood changes. Pregnant women are not advised to take this medication because of the possibility of the development of congenital anomalies in the fetus. Stopping the intake of phenytoin may not be always safe for the mother so the risks and benefits of taking phenytoin during pregnancy are discussed with the patient to identify the most feasible option for the patient [1, 2, 3, 4]. 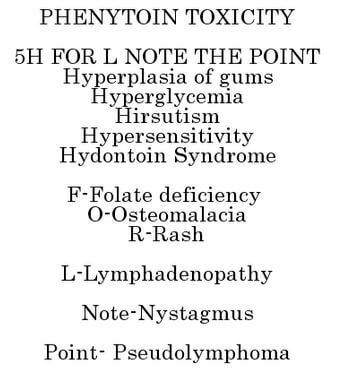 Phenytoin’s therapeutic level is identified to be between 10-20mcg/mL. The signs and symptoms associated with phenytoin toxicity will start to manifest when the serum level of this drug reaches 30 mcg/mL. There are certain factors which may put an individual at a higher risk for the toxicity of phenytoin. The degree of protein binding in the body plays a major role in the metabolism of this medication. Those who have decreased protein binding, such as neonates and elderly patients, have a higher risk than the general population. The metabolism of the drug is decreased and the drug may accumulate in the body [1, 2, 3, 4]. When the level of phenytoin reaches the toxic level, the patient may manifest with a febrile reaction and bradycardia. If the patient receives phenytoin intravenously, they may experience hypotension or low blood pressure. Oral intake of the drug is associated with the presence of gingival hyperplasia . The neurologic toxicity symptoms may include abnormal gait, confusion, irritability, agitation, respiratory distress, tremors, hallucinations, mental status alterations, peripheral neuropathy, dysphagia or difficulty in swallowing and the presence of more seizures. Extremely high levels of phenytoin in the blood can be fatal. Visual abnormalities may include horizontal and vertical nystagmus or involuntary eye movement, miosis or excessive constriction of the pupils, diplopia or double vision, and ophthalmoplegia or paralysis of the muscles surrounding the eye . Aside from hypotension, the use of intravenous phenytoin is associated with cardiac rhythm anomalies such as asystole and ventricular fibrillation. Tissue death may occur and may even lead to the formation of gangrene if not managed immediately. Elderly patients may manifest with the purple glove syndrome which is characterized by edema of the distal limbs, discoloration and feeling of pain after intravenous administration. Figure 1 shows the hands of a patient who developed the syndrome . Symptoms associated with the gastrointestinal system include nausea, vomiting, and tenderness in the right upper quadrant of the abdomen. Imaging tests will reveal hepatomegaly or enlargement of the liver and splenomegaly or enlargement of the spleen. Hepatitis or inflammation of the liver may also develop . Phenytoin is a class D drug because of the congenital anomalies a fetus may manifest after exposure to the drug. These signs may include cleft lip and palate, microcephaly or small head, hypoplasia of the distal phalanges, congenital heart defects, growth impairment, microcephaly or having a small head, low hairline, short neck, and low-set ears . The initial priority when the patient arrives in the emergency department is to support the airway, breathing, and circulation of the patient. An emergency intubation may be required if the patient manifests respiratory depression. An intravenous access will be established for the administration of fluid and other medications [1, 2, 3, 4]. If the patient is taking phenytoin orally, a gastric decontamination may be performed to help prevent the absorption of the remaining medication in the patient’s stomach. Once the patient is stable, the decontamination may begin. The use of activated charcoal is effective especially if it is given within an hour after the ingestion has taken place. Multiple doses may also be given every 2-6 hours until there is a passage of charcoal stool, absent bowel sounds or improved condition of the patient. The airway of the patients who are intubated should be covered or protected during the administration of activated charcoal to prevent aspiration [1, 2, 3, 4]. Other medications may be given depending on the symptoms that the patient has manifested. The hypotension resulting from the intravenous administration of phenytoin may be resolved by decreasing the rate of the infusion or the administration of vasopressors [1, 2, 3, 4]. Patients who have tried to ingest phenytoin intentionally should be referred to a psychiatrist for an evaluation to prevent another incident in the future [1, 2, 3, 4]. Those who are taking phenytoin may prevent toxicity by taking the medication according to the prescription of the physician. Also, the physician must be informed right away if pregnancy is suspected to avoid congenital anomalies in the fetus. Accidental ingestion of phenytoin can be prevented by properly labeling the medication bottle and keeping it in a place that is out of children’s reach [1, 2, 3, 4]. The intake of phenytoin is beneficial in the management of seizures but can be dangerous if the serum level exceeds the therapeutic range. If you have any experience with this occurrence, you can share it through the comment section.